Barack Obama may only have a few months left in the White House, but that’s not stopping him from completely abusing his executive powers every chance he gets. 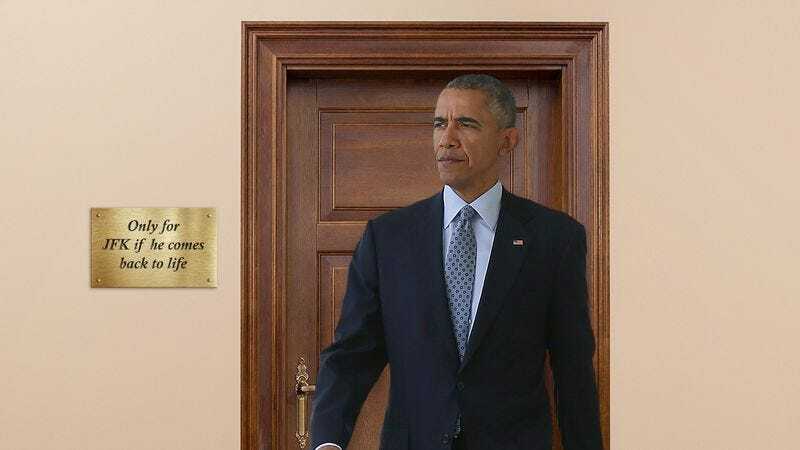 And his latest overreach is the most egregious yet: Yesterday morning, our president was caught using the bathroom reserved for JFK if he ever comes back to life. Okay, POTUS. This is simply too far. Since 1963, the bathroom outside of the Oval Office has been a sacred place reserved for the late John F. Kennedy, should he ever walk this earth again. Yet Mr. Obama’s actions showed absolutely zero respect for any potential scenario where JFK comes back to life and needs to use the facilities, as he desecrated the hallowed lavatory by using it himself. Our autocrat in chief went so far as to flip through the dossier placed on a small table next to the sink, meant to catch JFK up on five decades of global developments such as the deaths of his brothers and son. Upon hearing flushing within, excited White House staff gathered, certain that JFK’s mortal return was finally upon us. But they were shocked and angered when President Obama emerged instead, unconcerned with the extreme abuse of power he had just committed. You would’ve thought that Obama was looking forward to JFK coming back to life as much as anyone, but all this proves is that Obama thinks he’s above the rules. There’s no telling how many times Obama used JFK’s bathroom before being caught, and that’s a concerning thought. We can only hope that going forward, our president stops abusing his power and starts using the communal bathroom down the hall. January can’t come soon enough.